Minos is a seafaring nation to the south of Amber. They have a reputation of being the home of brave captains, cunning traders and fierce pirates. Their alliance with Amber came on the heels of a brutal naval war, when the last Grand Admiral of Minos, Stormalog, sailed his fleet on Amber, and reached the very mouth of its harbor before being stopped by Oberon. As a prize of victory, Oberon took Stormalog's wife, Rilga, as his own. Since that time, Minos has been a loyal, if troublesome, ally of Amber. Minosian traders were quick to take advantage of the trading opportunities that relations with Amber opened up, and Minosian pirates were only a few steps behind them. Never in such great numbers to be a menace, but always in numbers enough to at least be a nuisance. Minos is perceived to be ruled the the "sea kings". In Minos, every captain is a king, and the overall shape of their government is exactly as much of a mess as that might suggest. By tradition, captains don't own property outside of their ship and its cargo. His deeds of trade, war or piracy are expected to enrich their family's properties, which will in turn be invested in the ship and ventures. Historically, these families have been wives (the "Sea Queens") but Rilga's years as a fearsome pirate greatly disrupted those assumptions, and "port husbands" are now common enough to not merit comment, though it is still viewed as a womanly profession. In any case, there's an informal government of these landbound family members that corresponds with the loose alliances among the captains. While the Captains are fiercely independent, occasionally a leader will emerge, extract oaths or promises from other captains and be considered an Admiral. Some Admirals have had greater ambitions - nation or legacy building most often - but it tends to not work out in the face of Minosian politics. The closest thing to a real Government are the five commodores, retired captains who have been honored with the title and the right to run one of the five great ports of Minos. The Sea Kings have found a means of sailing through shadow without using shadowpaths. Not every captain necessarily has this secret, but those who do sail deep into shadow for trade and piracy. The blood of of storms runs through the veins of many captains. The vast history of byblows and bastards make this anything but a formal bloodline, and has been traced back to Stormalog, Rilga and other figures of history and fiction. Minos is more water than land, though it is not a true archipelago. The bulk of the population, and the five great ports, are all out among the many islands of Minos. Each port has a slightly different flavor and character. Cameron - Cameron is the largest port of Minos, and is effectively the capitol of Minos. 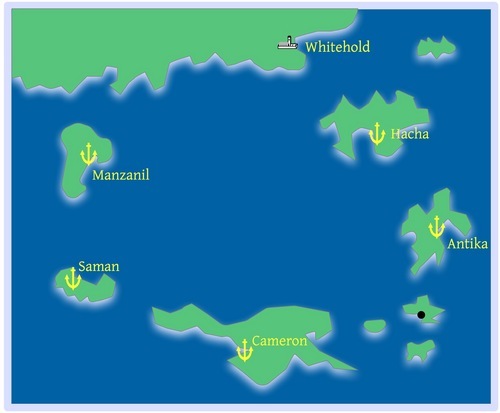 Manzanil - It is pretty much accepted that Manzanil is a den of pirates. The main landmass has little population and is a hostile place with no real resources of value. The only real civilization is Whitehold, a walled port town surrounded by forests, maintained by House Feldane of Amber. Minos is the land of the sail, and little is more important than the ships and the structure surrounding them. It's loose, informal and the line between merchant, smuggler and pirate tends to be very fuzzy indeed.